1To make the dressing, shake all the ingredients up in a jar. If you like, pour some over your slab of tofu and let it sit for a couple hours or up to a couple days. If you want to press it, do it after it comes out of the marinade. 2Cook the soba noodles according to package directions, then run them under cold water to cool them down and drain them well. Add the cucumber and green onion, drizzle with about half the dressing, toss and divide among your bowls. 3Cut the tofu into about 1" squares (or bite-sized pieces) and heat a drizzle of oil in a skillet set over medium-high heat. Add the tofu and brown on both (or all) sides. 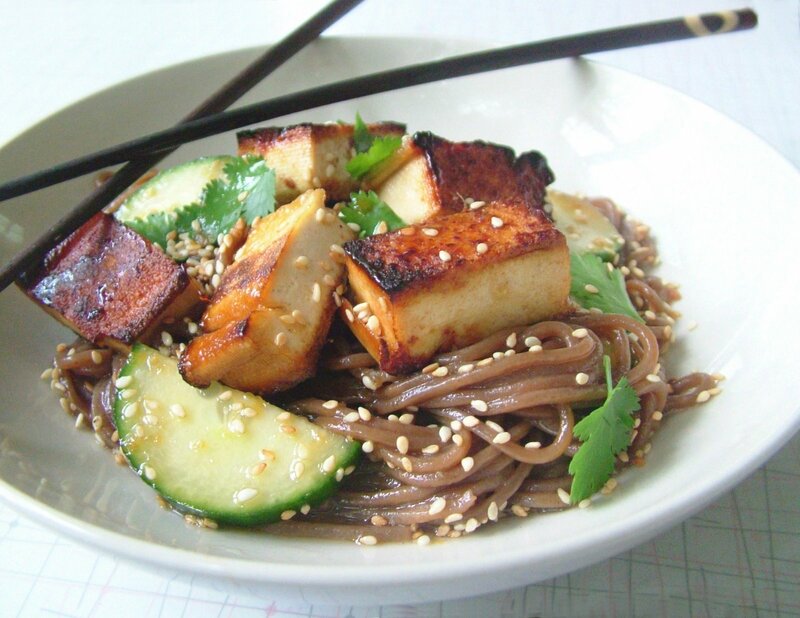 Divide the crispy tofu among the bowls, top with cilantro and sesame seeds, and drizzle with extra dressing. Serve immediately.